I really enjoy projects which involve taking an idea that worked a few years ago, and bringing it up to date. One project that we took on recently has allowed me to do just that. 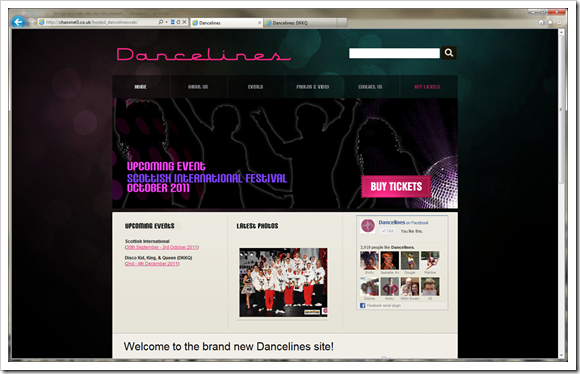 Dancelines is a national company that manages and stages international dance competitions and events. They have three signature events each year and each of these includes various heats leading up to the main events which occur over several days across the country. Their old web site was designed a few years ago by another designer and did its job well, but it had become neglected over the years, and really wasn’t doing its job properly in the modern age of social networking. In addition to that, there were a number of out-dated design elements including a loud music track that kicked in whenever you entered the site (which scared the crap out me on numerous occasions) and an image gallery that was built into the header in some sort of super widescreen mode that actually didn’t allow you to view the entire image. The home page… You should have heard the music! The image gallery page… You can’t actually see the images that you’re meant to be previewing! What we wanted to do was to give the site an up to date look, using modern techniques and style, whilst retaining the company’s bright identity. We went for a darker scheme for the frame of the site, but used Danceline’s bright identity to draw attention to key elements (such as the logo). The new homepage… Cleaner, less garish, but still sensitive to the brand. We also wanted to take advantage of the fan base behind Dancelines. The company has around 4,000 Facebook fans, and they’re very active on the fan page. We have taken advantage of this by incorporating Facebook into the site. The homepage includes a thumbnail view of Facebook fans, and the ability to become a fan straight from the new site. We also feature a feed of the latest activity from the Facebook fan page. Each page features a random photo from the collection, which highlights recent events. In addition to this, we allow users to “Like” pages and also comment directly on posts using their Facebook account. If the user comments on a post, it posts their comment along with a link to the post back to their personal Facebook wall to share with friends. Users can, of course, opt out of sharing if they wish. The site is much easier to navigate, and we’re working on ticket purchasing as the next phase. We’ve also given the gallery a clean up and you can now view slide shows, or flick through the gallery at a leisurely pace. The site is now easily updatable for Dancelines, so they can manage the entire site themselves without having to come back to us for updates. They can post news, event pages and images, as well as manage comments, from anywhere, even from a mobile device which will be great for their events. 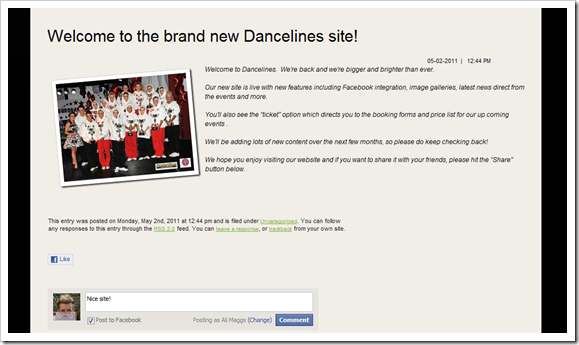 We’re happy to launch the site, today, at http://www.dancelines.com. If you have a web site that needs a makeover, please contact us to find out what we can do for your company/brand.